Pippa Middleton, the sister of Catherine, the Duchess of Cambridge and wife of James Matthews is pregnant with her first child. On Sunday a source told to U.K Sun, when Kate found out that she is pregnant, she was thrilled and utterly overjoyed. She informed her family and close friends about the news. Her sister, kate "could not have been more delighted" after hearing the news, the friend said. "It’s been a tough few weeks for the two families, so this has provided some much-needed happiness and light relief. Pippa and James have always known they wanted children. They have made the most of their first few months of marriage and felt the time was right to expand their family." The due date is in October, Pippa revealed the happy news after the 12 week scan. 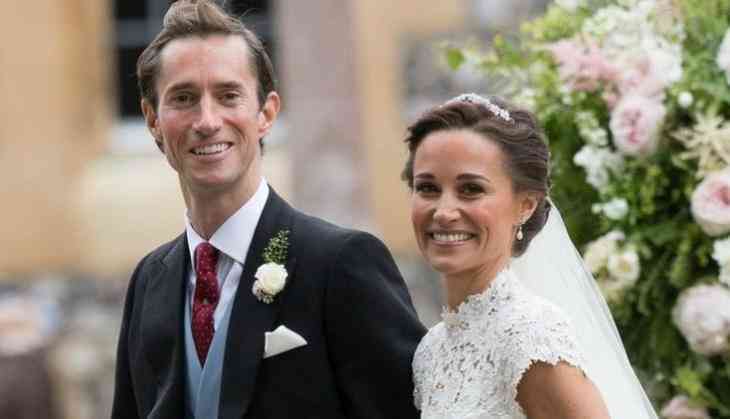 Pippa and James Matthews got engaged in 2016 and tied the knot in May 2017 at St Mark's Church in Englefield, Berkshire. The royal family's joy has been doubled as Duchess Catherine is also pregnant with her third child and the due date is tomorrow. A statement issued by Kensington Palace at the time said: "The Duke and Duchess of Cambridge are delighted to confirm they are expecting a baby in April 2018."